Push Your Luck Podcast: Dominant Species : It's a BLOODBATH! Right off the bat after the 1st round, I was left with only 1 species on the board. ONLY ONE. I have never felt so ganged up against as I was left with no tiles which I had dominance and almost all the card effects were applied that will impact me. From that turn onwards, I was suitably silent and wondering how to come back from it. When one is in a bad situation from the start, one usually choose the path of most destruction. As a spider I decided I should try to compete and also score for the tundra. In most games of Dominant species I realised that not a lot of people choose compete. Also in my past games, those that had control of the penguin card managed to score a lot of points. However in this regard I met Jillian who was playing the insects and also going for the same goal. So for most of the rest of the game, I was attempting very hard to diversify my spiders to be able to survive in more lands (because there were only 2 grub tokens left and I had to work hard to ensure it did not disappear). There were chances for Jillian to totally annhilate me from the board and make it really difficult for me to even get by but she did not remember the rule and I had a lucky pass. The rest of the game for me was to make ineffective attempts at attacking other players and trying hard to at least score some points. I did not really succeed in the Tundra scoring method though and only managed 15 points at the end game. Near the end I was also trying very hard to speciate but it was too little too late and I ended up dead last. Now in hindsight its interesting how a bad 1st round can quickly put you almost out of the game. You aren't out out per say because you can always come back and try to capitalize on other players' mistakes but that's not easy to come by and flip yourself from last to become first. Its also interesting how after the first round of ganging up, I kinda sensed that they felt they may have gone overboard with killing the spiders and set their targets elsewhere. The players next rotated between attacking the leaders or attacking those that have caused the most destruction. In this case, it seemed to be Jillian as she caused the Eruption which devastated a lot of opponents and kind of made her the next target. So all in all, its still a rather fun game and I can certainly appreciate the iPad version because it calculates the dominance for you quickly and accurately. More importantly, the AI are good and they process very fast too. 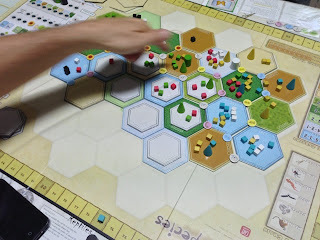 I realised that in a 6p game of Dominant species, AP will pretty much cause the game to drag on for way way too long and bog down. I remembered when this game was the hotness some 2-3 years ago and I was playing with 2 friends and we played it standing up because the meetup room wasn't open yet and we managed to zoom through a game in about 1 hour 15 mins or so. Finally, there were some comments as well of the differences between the newer and older edition. I personally liked the newer graphics because of all the fanciness and the coloful nature of the board and such. Dion and Bill both preferred the older, cleaner version because its easier to see what is happening. I do wish there was a compromise between the both, updated graphics and richer colors but still clean cut and easy to comprehend. Its still a fun game for me though we probably have to ensure that everyone comes away from it shaking hands and commenting good game and congratulating each other on the achievements we made because its certainly tough to play a game so intensely where you can sometimes feel backed into a corner by all players and everyone deserves a pat on their back for a job well done. Time to arrange for a rematch! My issue with Dominant Species is that the best strategy is to look like you aren't winning. The only reason I was able to win (via tiebreaker!) was that Jillian hurt Dion more than me on the last round, since he was "winning". It's still an enjoyable game, but diplomacy tends to dominate, at least when there are people who aren't that experienced, as some of the end-game scoring isn't obvious. actually a lot of games are like that (to look like you aren't winning) so as not to get targetted. Just like Die Macher I felt like I wasn't going to win and everyone was kind of targetting you because it seemed as if you are winning all the big votes.